Heterocycles in Life and Society is an introduction to the chemistry of heterocyclic compounds, focusing on their origin and occurrence in nature, biochemical significance and wide range of applications. Written in a readable and accessible style, the book takes a multidisciplinary approach to this extremely important area of organic chemistry. Topics covered include an introduction to the structure and properties of heterocycles; the key role of heterocycles in important life processes such as the transfer of hereditary information, how enzymes function, the storage and transport of bioenergy, and photosynthesis; applications of heterocycles in medicine, agriculture and industry; heterocycles in supramolecular chemistry; the origin of heterocycles on primordial Earth; and how heterocycles can help us solve 21st century challenges. 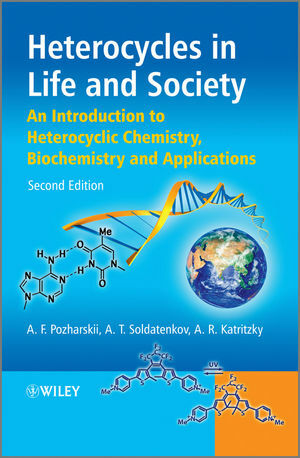 For this second edition, Heterocycles in Life and Society has been completely revised and expanded, drawing on a decade of innovation in heterocyclic chemistry. The new edition includes discussions of the role of heterocycles in nanochemistry, green chemistry, combinatorial chemistry, molecular devices and sensors, and supramolecular chemistry. Impressive achievements include the creation of various molecular devices, the recording and storage of information, the preparation of new organic conductors, and new effective drugs and pesticides with heterocyclic structures. Much new light has been thrown on various life processes, while the chemistry of heterocycles has expanded to include new types of heterocyclic structures and reactions, and the use of heterocyclic molecules as ionic liquids and proton sponges. Heterocycles in Life and Society is an essential guide to this important field for students and researchers in chemistry, biochemistry, and drug discovery, and scientists at all levels wishing to expand their scientific horizon. Alexander F. Pozharskii, Soros Professor of Chemistry, Southern Federal University, Rostov-on-Don, Russia. Anatoly T. Soldatenkov, Professor of Chemistry, Russian People's Friendship University, Moscow, Russia. Alan R. Katritzky, Kenan Professor of Chemistry, University of Florida, Gainesville, USA. 12.4 Do Heterocycles exist on the Moon and Mars? · Stresses the interdisciplinary nature of heterocycles: its influence pervades biochemistry, medicine, agricultural chemistry and technology.